Additive synthesis is a sound synthesis technique that creates timbre by adding sine waves together. The timbre of musical instruments can be considered in the light of Fourier theory to consist of multiple harmonic or inharmonic partials or overtones. Each partial is a sine wave of different frequency and amplitude that swells and decays over time due to modulation from an ADSR envelope or low frequency oscillator. Additive synthesis most directly generates sound by adding the output of multiple sine wave generators. Alternative implementations may use pre-computed wavetables or the inverse Fast Fourier transform. The sounds that are heard in everyday life are not characterized by a single frequency. Instead, they consist of a sum of pure sine frequencies, each one at a different amplitude. When humans hear these frequencies simultaneously, we can recognize the sound. This is true for both "non-musical" sounds (e.g. water splashing, leaves rustling, etc.) and for "musical sounds" (e.g. a piano note, a bird's tweet, etc.). This set of parameters (frequencies, their relative amplitudes, and how the relative amplitudes change over time) are encapsulated by the timbre of the sound. Fourier analysis is the technique that is used to determine these exact timbre parameters from an overall sound signal; conversely, the resulting set of frequencies and amplitudes is called the Fourier series of the original sound signal. In the case of a musical note, the lowest frequency of its timbre is designated as the sound's fundamental frequency. For simplicity, we often say that the note is playing at that fundamental frequency (e.g. "middle C is 261.6 Hz"), even though the sound of that note consists of many other frequencies as well. The set of the remaining frequencies is called the overtones (or the harmonics) of the sound. In other words, the fundamental frequency alone is responsible for the pitch of the note, while the overtones define the timbre of the sound. The overtones of a piano playing middle C will be quite different from the overtones of a violin playing the same note; that's what allows us to differentiate the sounds of the two instruments. There are even subtle differences in timbre between different versions of the same instrument (for example, an upright piano vs. a grand piano). Additive synthesis aims to exploit this property of sound in order to construct timbre from the ground up. By adding together pure frequencies (sine waves) of varying frequencies and amplitudes, we can precisely define the timbre of the sound that we want to create. Harmonic additive synthesis is closely related to the concept of a Fourier series which is a way of expressing a periodic function as the sum of sinusoidal functions with frequencies equal to integer multiples of a common fundamental frequency. These sinusoids are called harmonics, overtones, or generally, partials. In general, a Fourier series contains an infinite number of sinusoidal components, with no upper limit to the frequency of the sinusoidal functions and includes a DC component (one with frequency of 0 Hz). Frequencies outside of the human audible range can be omitted in additive synthesis. As a result, only a finite number of sinusoidal terms with frequencies that lie within the audible range are modeled in additive synthesis. , are omitted in the following expressions of additive synthesis. is the fundamental frequency of the waveform and the frequency of the musical note. Example of harmonic additive synthesis in which each harmonic has a time-dependent amplitude. The fundamental frequency is 440 Hz. Example of inharmonic additive synthesis in which both the amplitude and frequency of each partial are time-dependent.
. This is the case whether the partial is harmonic or inharmonic and whether its frequency is constant or time-varying. Additive synthesis more broadly may mean sound synthesis techniques that sum simple elements to create more complex timbres, even when the elements are not sine waves. For example, F. Richard Moore listed additive synthesis as one of the "four basic categories" of sound synthesis alongside subtractive synthesis, nonlinear synthesis, and physical modeling. In this broad sense, pipe organs, which also have pipes producing non-sinusoidal waveforms, can be considered as a variant form of additive synthesizers. Summation of principal components and Walsh functions have also been classified as additive synthesis. Additive synthesis can be implemented using a bank of sinusoidal oscillators, one for each partial. In the case of harmonic, quasi-periodic musical tones, wavetable synthesis can be as general as time-varying additive synthesis, but requires less computation during synthesis. As a result, an efficient implementation of time-varying additive synthesis of harmonic tones can be accomplished by use of wavetable synthesis. Group additive synthesis is a method to group partials into harmonic groups (having different fundamental frequencies) and synthesize each group separately with wavetable synthesis before mixing the results. An inverse Fast Fourier transform can be used to efficiently synthesize frequencies that evenly divide the transform period or "frame". By careful consideration of the DFT frequency-domain representation it is also possible to efficiently synthesize sinusoids of arbitrary frequencies using a series of overlapping frames and the inverse Fast Fourier transform. It is possible to analyze the frequency components of a recorded sound giving a "sum of sinusoids" representation. This representation can be re-synthesized using additive synthesis. One method of decomposing a sound into time varying sinusoidal partials is short-time Fourier transform (STFT)-based McAulay-Quatieri Analysis. By modifying the sum of sinusoids representation, timbral alterations can be made prior to resynthesis. For example, a harmonic sound could be restructured to sound inharmonic, and vice versa. Sound hybridisation or "morphing" has been implemented by additive resynthesis. 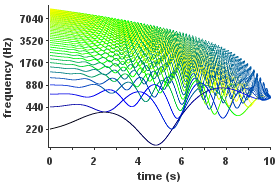 Additive analysis/resynthesis has been employed in a number of techniques including Sinusoidal Modelling, Spectral Modelling Synthesis (SMS), and the Reassigned Bandwidth-Enhanced Additive Sound Model. Software that implements additive analysis/resynthesis includes: SPEAR, LEMUR, LORIS, SMSTools, ARSS. New England Digital Synclavier had a resynthesis feature where samples could be analyzed and converted into ”timbre frames” which were part of its additive synthesis engine. Technos acxel, launched in 1987, utilized the additive analysis/resynthesis model, in an FFT implementation. Additive synthesis is used in electronic musical instruments. It is the principal sound generation technique used by Eminent organs. In linguistics research, harmonic additive synthesis was used in 1950s to play back modified and synthetic speech spectrograms. Later, in early 1980s, listening tests were carried out on synthetic speech stripped of acoustic cues to assess their significance. Time-varying formant frequencies and amplitudes derived by linear predictive coding were synthesized additively as pure tone whistles. This method is called sinewave synthesis. Also the composite sinusoidal modeling (CSM) used on a singing speech synthesis feature on Yamaha CX5M (1984), is known to use a similar approach which was independently developed during 1966–1979. These methods are characterized by extraction and recomposition of a set of significant spectral peaks corresponding to the several resonance modes occurred in the oral cavity and nasal cavity, in a viewpoint of acoustics. This principle was also utilized on a physical modeling synthesis method, called modal synthesis. Harmonic analysis was discovered by Joseph Fourier, who published an extensive treatise of his research in the context of heat transfer in 1822. The theory found an early application in prediction of tides. Around 1876, Lord Kelvin constructed a mechanical tide predictor. It consisted of a harmonic analyzer and a harmonic synthesizer, as they were called already in the 19th century. The analysis of tide measurements was done using James Thomson's integrating machine. The resulting Fourier coefficients were input into the synthesizer, which then used a system of cords and pulleys to generate and sum harmonic sinusoidal partials for prediction of future tides. In 1910, a similar machine was built for the analysis of periodic waveforms of sound. The synthesizer drew a graph of the combination waveform, which was used chiefly for visual validation of the analysis. Georg Ohm applied Fourier's theory to sound in 1843. The line of work was greatly advanced by Hermann von Helmholtz, who published his eight years worth of research in 1863. Helmholtz believed that the psychological perception of tone color is subject to learning, while hearing in the sensory sense is purely physiological. He supported the idea that perception of sound derives from signals from nerve cells of the basilar membrane and that the elastic appendages of these cells are sympathetically vibrated by pure sinusoidal tones of appropriate frequencies. Helmholtz agreed with the finding of Ernst Chladni from 1787 that certain sound sources have inharmonic vibration modes. In Helmholtz's time, electronic amplification was unavailable. For synthesis of tones with harmonic partials, Helmholtz built an electrically excited array of tuning forks and acoustic resonance chambers that allowed adjustment of the amplitudes of the partials. Built at least as early as in 1862, these were in turn refined by Rudolph Koenig, who demonstrated his own setup in 1872. For harmonic synthesis, Koenig also built a large apparatus based on his wave siren. It was pneumatic and utilized cut-out tonewheels, and was criticized for low purity of its partial tones. Also tibia pipes of pipe organs have nearly sinusoidal waveforms and can be combined in the manner of additive synthesis. In 1938, with significant new supporting evidence, it was reported on the pages of Popular Science Monthly that the human vocal cords function like a fire siren to produce a harmonic-rich tone, which is then filtered by the vocal tract to produce different vowel tones. By the time, the additive Hammond organ was already on market. Most early electronic organ makers thought it too expensive to manufacture the plurality of oscillators required by additive organs, and began instead to build subtractive ones. In a 1940 Institute of Radio Engineers meeting, the head field engineer of Hammond elaborated on the company's new Novachord as having a “subtractive system” in contrast to the original Hammond organ in which “the final tones were built up by combining sound waves”. Alan Douglas used the qualifiers additive and subtractive to describe different types of electronic organs in a 1948 paper presented to the Royal Musical Association. The contemporary wording additive synthesis and subtractive synthesis can be found in his 1957 book The electrical production of music, in which he categorically lists three methods of forming of musical tone-colours, in sections titled Additive synthesis, Subtractive synthesis, and Other forms of combinations. A typical modern additive synthesizer produces its output as an electrical, analog signal, or as digital audio, such as in the case of software synthesizers, which became popular around year 2000. The following is a timeline of historically and technologically notable analog and digital synthesizers and devices implementing additive synthesis. 1933 1935 Hammond Organ Company Hammond Organ An electronic additive synthesizer that was commercially more successful than Telharmonium. Implemented sinusoidal additive synthesis using tonewheels and magnetic pickups. Invented by Laurens Hammond. 1958 ANS An additive synthesizer that played microtonal spectrogram-like scores using multiple multi-track optical tonewheels. Invented by Evgeny Murzin. A similar instrument that utilized electronic oscillators, the Oscillator Bank, and its input device Spectrogram were realized by Hugh Le Caine in 1959. 1963 MIT An off-line system for digital spectral analysis and resynthesis of the attack and steady-state portions of musical instrument timbres by David Luce. 1979 1979 New England Digital Synclavier II A commercial digital synthesizer that enabled development of timbre over time by smooth cross-fades between waveforms generated by additive synthesis. is the discrete-time backward difference instantaneous frequency. ^ Gordon Reid. "Synth Secrets, Part 14: An Introduction To Additive Synthesis". Sound on Sound (January 2000). Retrieved 14 January 2012. ^ Mottola, Liutaio (31 May 2017). "Table of Musical Notes and Their Frequencies and Wavelengths". ^ "Fundamental Frequency and Harmonics". ^ Smith III, Julius O. (2011). "Additive Synthesis (Early Sinusoidal Modeling)". Spectral Audio Signal Processing. CCRMA, Department of Music, Stanford University. ISBN 978-0-9745607-3-1. Retrieved 9 January 2012. ^ Roads, Curtis (1995). The Computer Music Tutorial. MIT Press. p. 134. ISBN 978-0-262-68082-0. ^ a b Moore, F. Richard (1995). Foundations of Computer Music. Prentice Hall. p. 16. ISBN 978-0-262-68082-0. ^ Roads, Curtis (1995). The Computer Music Tutorial. MIT Press. pp. 150–153. ISBN 978-0-262-68082-0. ^ Robert Bristow-Johnson (November 1996). "Wavetable Synthesis 101, A Fundamental Perspective" (PDF). ^ Andrew Horner (November 1995). "Wavetable Matching Synthesis of Dynamic Instruments with Genetic Algorithms". Journal of the Audio Engineering Society. 43 (11): 916–931. ^ Julius O. Smith III. "Group Additive Synthesis". CCRMA, Stanford University. Archived from the original on 6 June 2011. Retrieved 12 May 2011. ^ P. Kleczkowski (1989). "Group additive synthesis". Computer Music Journal. 13 (1): 12–20. doi:10.2307/3679851. JSTOR 3679851. ^ B. Eaglestone and S. Oates (1990). "Analytical tools for group additive synthesis". Proceedings of the 1990 International Computer Music Conference, Glasgow. Computer Music Association. ^ a b Rodet, X.; Depalle, P. (1992). "Spectral Envelopes and Inverse FFT Synthesis". Proceedings of the 93rd Audio Engineering Society Convention. CiteSeerX 10.1.1.43.4818. ^ McAulay, R. J.; Quatieri, T. F. (1988). "Speech Processing Based on a Sinusoidal Model" (PDF). The Lincoln Laboratory Journal. 1 (2): 153–167. Archived from the original (PDF) on 21 May 2012. Retrieved 9 December 2013. ^ McAulay, R. J.; Quatieri, T. F. (August 1986). "Speech analysis/synthesis based on a sinusoidal representation". IEEE Transactions on Acoustics, Speech, Signal Processing ASSP-34: 744–754. ^ a b Serra, Xavier (1989). A System for Sound Analysis/Transformation/Synthesis based on a Deterministic plus Stochastic Decomposition (Ph.D. thesis). Stanford University. Retrieved 13 January 2012. ^ Smith III, Julius O.; Serra, Xavier. "PARSHL: An Analysis/Synthesis Program for Non-Harmonic Sounds Based on a Sinusoidal Representation". Retrieved 9 January 2012. ^ Fitz, Kelly (1999). The Reassigned Bandwidth-Enhanced Method of Additive Synthesis (Ph.D. thesis). Dept. of Electrical and Computer Engineering, University of Illinois at Urbana-Champaign. CiteSeerX 10.1.1.10.1130. ^ Loscos, A. (2007). Spectral processing of the singing voice (Ph.D thesis). Barcelona, Spain: Pompeu Fabra University. hdl:10803/7542. (PDF). ^ Loscos 2007, p. 44, "Spectral peak processing"
^ Loscos 2007, p. 44, "Phase locked vocoder"
^ Bonada, Jordi; Loscos, Alex (2003). "Sample-based singing voice synthesizer by spectral concatenation: 6. Concatenating Samples". Proc. of SMAC 03: 439–442. ^ a b c Cooper, F. S.; Liberman, A. M.; Borst, J. M. (May 1951). "The interconversion of audible and visible patterns as a basis for research in the perception of speech". Proc. Natl. Acad. Sci. U.S.A. 37 (5): 318–25. doi:10.1073/pnas.37.5.318. PMC 1063363. PMID 14834156. ^ Remez, R.E. ; Rubin, P.E. ; Pisoni, D.B. ; Carrell, T.D. (1981). "Speech perception without traditional speech cues". Science. 212 (4497): 947–950. doi:10.1126/science.7233191. PMID 7233191. ^ Rubin, P.E. (1980). "Sinewave Synthesis Instruction Manual (VAX)" (PDF). Internal Memorandum. Haskins Laboratories, New Haven, CT.
^ Sagayama, S.; Itakura, F. (1986). "Duality theory of composite sinusoidal modeling and linear prediction". ICASSP '86. IEEE International Conference on Acoustics, Speech, and Signal Processing. Acoustics, Speech, and Signal Processing, IEEE International Conference on ICASSP '86. 11 (published April 1986). pp. 1261–1264. doi:10.1109/ICASSP.1986.1168815. ^ Morrison, Joseph Derek (IRCAM); Adrien, Jean-Marie (1993). "MOSAIC: A Framework for Modal Synthesis". Computer Music Journal. 17 (1): 45–56. doi:10.2307/3680569. JSTOR 3680569. ^ Doel, Kees van den; Pai, Dinesh K. (2003). Greenebaum, K. (ed.). "Modal Synthesis For Vibrating Object" (PDF). Audio Anecdotes. Natick, MA: AK Peter. When a solid object is struck, scraped, or engages in other external interactions, the forces at the contact point causes deformations to propagate through the body, causing its outer surfaces to vibrate and emit sound waves. ... A good physically motivated synthesis model for objects like this is modal synthesis ... where a vibrating object is modeled by a bank of damped harmonic oscillators which are excited by an external stimulus. ^ Prestini, Elena (2004) [Rev. ed of: Applicazioni dell'analisi armonica. Milan: Ulrico Hoepli, 1996]. The Evolution of Applied Harmonic Analysis: Models of the Real World. trans. New York, USA: Birkhäuser Boston. pp. 114–115. ISBN 978-0-8176-4125-2. Retrieved 6 February 2012. ^ Fourier, Jean Baptiste Joseph (1822). Théorie analytique de la chaleur [The Analytical Theory of Heat] (in French). Paris, France: Chez Firmin Didot, père et fils. ^ a b c Miller, Dayton Clarence (1926) [First published 1916]. The Science Of Musical Sounds. New York: The Macmillan Company. pp. 110, 244–248. ^ Thomson, Sir W. (1878). "Harmonic analyzer". Proceedings of the Royal Society of London. Taylor and Francis. 27 (185–189): 371–373. doi:10.1098/rspl.1878.0062. JSTOR 113690. ^ a b c Cahan, David (1993). Cahan, David (ed.). Hermann von Helmholtz and the foundations of nineteenth-century science. Berkeley and Los Angeles, USA: University of California Press. pp. 110–114, 285–286. ISBN 978-0-520-08334-9. ^ Helmholtz, von, Hermann (1863). Die Lehre von den Tonempfindungen als physiologische Grundlage für die Theorie der Musik [On the sensations of tone as a physiological basis for the theory of music] (in German) (1st ed.). Leipzig: Leopold Voss. pp. v.
^ a b Christensen, Thomas Street (2002). The Cambridge History of Western Music. Cambridge, United Kingdom: Cambridge University Press. pp. 251, 258. ISBN 978-0-521-62371-1. ^ a b c von Helmholtz, Hermann (1875). On the sensations of tone as a physiological basis for the theory of music. London, United Kingdom: Longmans, Green, and co. pp. xii, 175–179. ^ Russell, George Oscar (1936). Year book - Carnegie Institution of Washington (1936). Carnegie Institution of Washington: Year Book. 35. Washington: Carnegie Institution of Washington. pp. 359–363. ^ Lodge, John E. (April 1938). Brown, Raymond J. (ed.). "Odd Laboratory Tests Show Us How We Speak: Using X Rays, Fast Movie Cameras, and Cathode-Ray Tubes, Scientists Are Learning New Facts About the Human Voice and Developing Teaching Methods To Make Us Better Talkers". Popular Science Monthly. New York, USA: Popular Science Publishing. 132 (4): 32–33. ^ Comerford, P. (1993). "Simulating an Organ with Additive Synthesis". Computer Music Journal. 17 (2): 55–65. doi:10.2307/3680869. JSTOR 3680869. ^ "Institute News and Radio Notes". Proceedings of the IRE. 28 (10): 487–494. 1940. doi:10.1109/JRPROC.1940.228904. ^ Douglas, A. (1948). "Electrotonic Music". Proceedings of the Royal Musical Association. 75: 1–12. doi:10.1093/jrma/75.1.1. ^ Douglas, Alan Lockhart Monteith (1957). The Electrical Production of Music. London, UK: Macdonald. pp. 140, 142. ^ Pejrolo, Andrea; DeRosa, Rich (2007). Acoustic and MIDI orchestration for the contemporary composer. Oxford, UK: Elsevier. pp. 53–54. ^ a b c Weidenaar, Reynold (1995). Magic Music from the Telharmonium. Lanham, MD: Scarecrow Press. ISBN 978-0-8108-2692-2. ^ a b Moog, Robert A. (October – November 1977). "Electronic Music". Journal of the Audio Engineering Society (JAES). 25 (10/11): 856. ^ a b Olsen, Harvey (14 December 2011). Brown, Darren T. (ed.). "Leslie Speakers and Hammond organs: Rumors, Myths, Facts, and Lore". The Hammond Zone. Hammond Organ in the U.K. Retrieved 20 January 2012. ^ Holzer, Derek (22 February 2010). "A brief history of optical synthesis". Retrieved 13 January 2012. ^ Vail, Mark (1 November 2002). "Eugeniy Murzin's ANS — Additive Russian synthesizer". Keyboard Magazine: 120. ^ Young, Gayle. "Oscillator Bank (1959)". ^ Young, Gayle. "Spectrogram (1959)". ^ a b Luce, David Alan (1963). Physical correlates of nonpercussive musical instrument tones. Cambridge, Massachusetts, U.S.A.: Massachusetts Institute of Technology. hdl:1721.1/27450. ^ a b Beauchamp, James (17 November 2009). "The Harmonic Tone Generator: One of the First Analog Voltage-Controlled Synthesizers". Prof. James W. Beauchamp Home Page. ^ Beauchamp, James W. (October 1966). "Additive Synthesis of Harmonic Musical Tones". Journal of the Audio Engineering Society. 14 (4): 332–342. ^ a b c d "RMI Harmonic Synthesizer". Synthmuseum.com. Archived from the original on 9 June 2011. Retrieved 12 May 2011. ^ a b c Reid, Gordon. "PROG SPAWN! The Rise And Fall Of Rocky Mount Instruments (Retro)". Sound on Sound (December 2001). Archived from the original on 25 December 2011. Retrieved 22 January 2012. ^ Flint, Tom. "Jean Michel Jarre: 30 Years Of Oxygene". Sound on Sound (February 2008). Retrieved 22 January 2012. ^ "Allen Organ Company". fundinguniverse.com. ^ a b Cosimi, Enrico (20 May 2009). "EMS Story - Prima Parte" [EMS Story - Part One]. Audio Accordo.it (in Italian). Retrieved 21 January 2012. ^ a b Hinton, Graham (2002). "EMS: The Inside Story". Electronic Music Studios (Cornwall). Archived from the original on 21 May 2013. ^ The New Sound of Music (TV). UK: BBC. 1979. Includes a demonstration of DOB and AFB. ^ Leete, Norm. "Fairlight Computer – Musical Instrument (Retro)". Sound on Sound (April 1999). Retrieved 29 January 2012. ^ Twyman, John (1 November 2004). (inter)facing the music: The history of the Fairlight Computer Musical Instrument (pdf) (Bachelor of Science (Honours) thesis). Unit for the History and Philosophy of Science, University of Sydney. Retrieved 29 January 2012. ^ Street, Rita (8 November 2000). "Fairlight: A 25-year long fairytale". Audio Media magazine. IMAS Publishing UK. Archived from the original on 8 October 2003. Retrieved 29 January 2012. ^ "Computer Music Journal" (JPG). 1978. Retrieved 29 January 2012. ^ a b Leider, Colby (2004). "The Development of the Modern DAW". Digital Audio Workstation. McGraw-Hill. p. 58. ^ a b c Joel, Chadabe (1997). Electric Sound. Upper Saddle River, N.J., U.S.A.: Prentice Hall. pp. 177–178, 186. ISBN 978-0-13-303231-4.